From the Outdoor Discovery School offered by LL Bean to the slopes of Sunday River and even the bike paths in and around Portland - retirees (and those soon to retire) are rediscovering the Maine outdoors. The healthy fresh air lifestyle has persuaded a significant number of them to ignore the conventional wisdom of spending one's elder years someplace warm and sedentary. For anyone who enjoys the outdoors and nature, Maine is the place to be! This trend has resulted in enclaves of the outdoor-oriented forming around the state. One of the most active - in winter at least - is centered around the Sugarloaf ski area in Carrabassett Valley. The area offers spectacular skiing and other winter sports, of course, but also many choices in condominium living. In the spring, summer and fall, golfing and the mountains await. 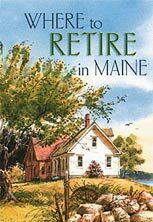 The move to Maine in retirement can happen in many ways. One of the most popular is the renting or purchasing of a small camp to be used as a vacation retreat prior to retirement. Then when the time is right "trading up" to a year-round condominium is a logical progression. In many planned developments, whether independent or assisted-living, there is often an active community of individuals with similar interests, whether it's skiing in the winter or golfing, sailing or hiking in the warmer months. For example the Carrabassett Valley Outdoor Association organizes events and trips almost every week and ad hoc activities can be found regularly. It's not all about the mountains and skiing. Many retirees prefer a more urban environment - like the greater Portland area - while others are more interested in the many lakes and rivers that Maine has to offer. Essentially there are two types of people - those who love warm and those who love Maine. For people who want an active, outdoor lifestyle, Maine has all the outdoor activity you might want. Plus the physical beauty is simply outstanding! Contrary to popular thinking, Southern Maine has many affordable housing options for retirees – and a wide array of health care options. Retirees on a budget can enjoy unrivaled activities all year round. Portland offers a relaxed urban environment coupled with a wide variety of cultural, dining and outdoor activities. The ocean is nearby and great fishing on one of Maine’s lakes or excellent skiing is only a short drive away. For example, Sebago Lake is less than 40 minutes by car. For retirees wishing to keep working or reinvent themselves Portland offers a relatively low unemployment rate, at just 2.8% in 2018. Employers such as the Maine Medical Center and L.L. Bean as well as ample small business help to keep the workplace thriving. Portland is also well known as being friendly toward entrepreneurs. Maine is a large and geographically diverse place. Other areas to consider include: the beaches along the southern most part of the state; the mountains and lakes in the west; the mid-coast; the Highlands (which include Bangor) and Downeast/Acadia. All offer a unique living experience. To learn more, take a Tour of Maine.